OneDrive doesn’t sync or not syncing all files? The best OneDrive sync tool-AOMEI Backupper Standard will give you the best way to fix OneDrive sync problems in your Windows 7/8/10. I have a problem with OneDrive, I have been using OneDrive for several years, it’s going perfect and never gives me any problems. My computer and iPhone are also installed the OneDrive application. However, 2 weeks ago, I have discovered that files saved to OneDrive not synced on my PC, so I can’t access these files via the application on my iPhone or online. I click on the OneDrive icon and a window pops up saying that all my files are up to date. If I open up OneDrive, there are some files need to be synced as indicated. Therefore, OneDrive sync problems confused me. Besides, I can upload files from the app on my phone, and these files sync with OneDrive and the OneDrive desktop folder on my PC. However, if I add a file via my PC, it does not sync. Can anyone have any ideas to help me out, Thanks. Make sure your file is not larger than 10GB, which is the OneDrive file size limit. Make sure you have the latest Windows update. Update to the latest version of OneDrive. If you could not fix these OneDrive sync issues with these solutions, maybe you should turn to a better solution for help. How to Sync Files or Folders to OneDrive Freely? 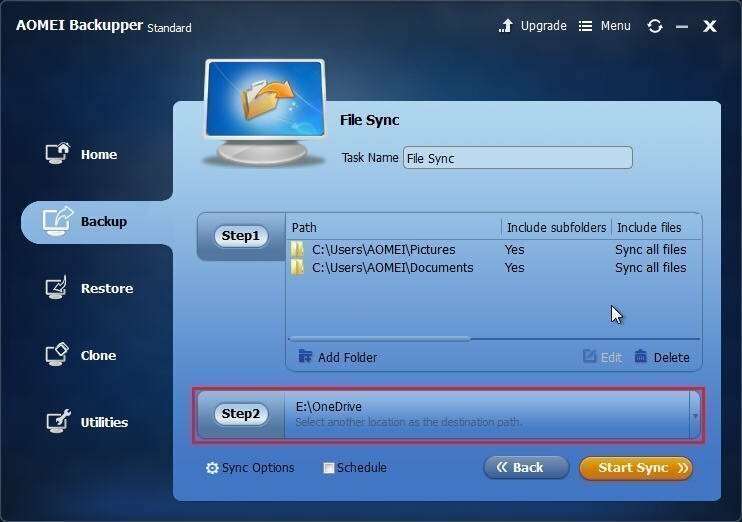 In order to fix One Drive not syncing problem, you would better to free download the best free OneDrive sync tool-AOMEI Backupper Standard to have a try. AOMEI Backupper Standard as the best backup software has many powerful features, like file sync, real-time sync, file backup, system backup, partition backup, and so on. It applies to popular personal Windows operating system like Windows Vista, XP, 7, 8, 8.1, 10. AOMEI Backupper Standard will sync your files like photos, music, videos, work documents to local hard drive, external hard drive, cloud storage drive, etc. Install AOMEI Backupper Standard, then run the procedure. To repair OneDrive not syncing in Windows 7/8/10, select Backup at the left panel and click File Sync. In next window, edit the Task Name to distinguish from other tasks. At the Step1, click Add Folder to choose files or folders should be synced. Select the OneDrive desktop folder as the destination to save these files from your computer in the Step2. 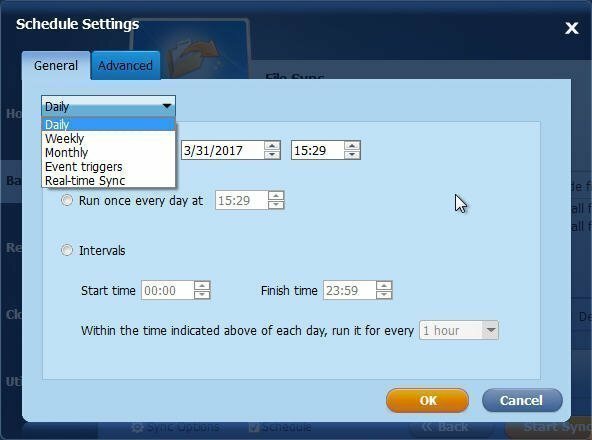 Notes: If you tick Schedule option to choose Real-time sync, you can sync files or folders to OneDrive automatically. Click Start Sync to fix OneDrive not syncing problem. It’s obvious that AOMEI Backupper Standard is easy to solve the problem that OneDrive doesn’t sync in Windows 7/8/10. Besides, it offers you the ability to create incremental and differential backup, spilt backup image, clone partition, disk, and more. 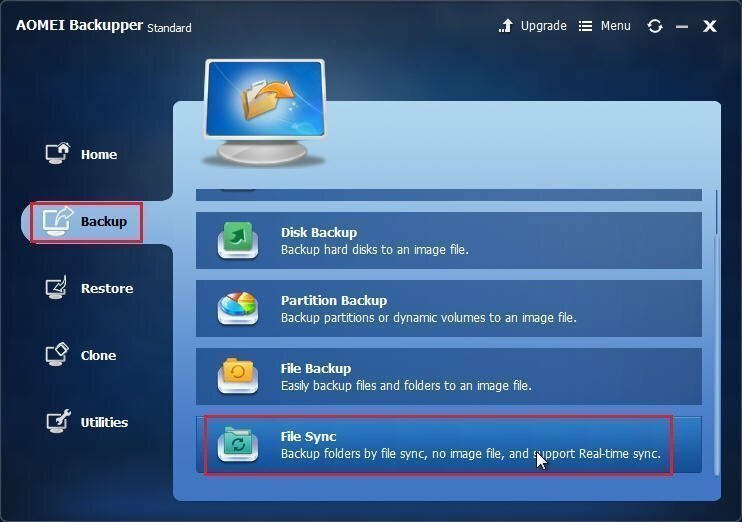 For advanced users, AOMEI Backupper Professional will satisfy you, such as system clone, command line backup, etc.